There are many conditions of the skin and nails that we, as Pedorthists, often see in our patients. While we do not treat any skin or nail maladies, they certainly do present in our clinics frequently. In most cases, we recommend that our patient seek the advice of their family doctor on how to treat these conditions, but in rare cases, we may refer patient to a chiropodist for specialized care. This post is intended to provide information about some of the conditions we see in clinic, not to diagnose or provide medical advice in any manner. You should discuss any concerns you have regarding your health with your primary medical provider. Please note that we have included photos of real skin conditions that may not be suitable for all readers. Athlete’s foot, also known as tinea pedis, is a fungal infection of the feet that causes redness, itching, burning and sometimes blistering of the skin of the feet. A common infection in athletes and non-athletes alike, the fungus grows best in a warm, moist environment (like your gym shoes!). Common areas for athlete’s foot infections include between the toes and the sole of the foot, but the fungus can infect any area of the foot. Athlete’s foot is typically treated with a topical anti-fungal agent, but may require an oral medication in severe cases. Treatment options should be discussed with your family doctor. Prevention strategies include: wearing sandals in shared shower spaces (at the gym, dorm or work), adopting a daily foot care routine (wash and dry thoroughly), choosing breathable footwear and using medicated foot powders to reduce moisture in footwear. Nail fungus (onychomycosis) is a condition of the toenails that begins as discolouration of the nail (as a white or yellow spot) and can progress to thickening, crumbling and deterioration of the entire nail. Early stages of nail fungus are often painless, but can worsen over time and if left untreated, develop into a more painful, chronic condition. Fungal nail infections are cased be a variety of fungal organisms, with the most common being a fungus called dermatophyte. Fungal nail infections are more common in older adults, because as the nail ages, it can become more brittle and dry and circulation in the feet also slows as we age. Nail fungus can stem from a fungal skin infection such as athlete’s foot and can also spread to other nails if left untreated. Fungal nail infections are most commonly treated first with a topical anti-fungal agent used directly on the nail itself. As many infections are not always diagnosed at the early stages, the infection may become more complex, and require oral anti fungal medication, sometimes in combination with the topical agent. Preventative measures for nail fungus are similar to those for fungal skin infections; wash and dry your feet and toes thoroughly (daily), choose breathable footwear, and keep nails trimmed and filed smooth. Dyshidrotic eczema is a less common condition of the hands and feet that results in an itchy rash characterized by small, water filled blisters. 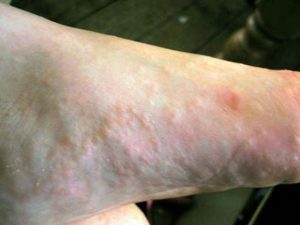 More common in the hands than the feet, dyshidrotic eczema comes and goes, with flare-ups more common during warmer weather. There is not a specific known cause for dyshidrotic eczema, but experts believe breakouts may be linked to seasonal allergies and stress. Dyshidrotic eczema is typically treated with over the counter oral antihistamines, oral or topical steroid medications or, in more chronic cases, UV light therapy. To prevent outbreaks, identifying and avoiding irritants is key, in addition to maintaining your skin health with a non-scented moisturizer. Psoriasis is a non-contagious, chronic condition of the skin that affects 2-3% of adults. Symptoms include raised, red patches of skin with a grey or silvery scale on top of the affected areas. Patches are typically found on the elbows, knees, back, scalp, buttocks and feet. Areas that are exposed to rubbing or friction (like the ankles, heels and soles of the feet) are also more likely to be affected. Psoriasis can be classified as mild, moderate or severe, depending on the number, size and severity of the lesions involved. Nails can also be affected by psoriasis, causing indentations, pitting or lifting of the nail from the nail bed. There are several prescription treatments available for psoriasis. one of the most common treatments is a topical corticosteroid treatment, in either a cream or ointment form. In more severe cases, UV treatment, oral medications and other treatments may be recommended by your doctor. Pitted keratolysis is an infection of the skin which commonly affects the soles of the feet or palms of the hands. Typically affecting more males than females, this bacterial infection may cause an unpleasant odour, appearing as white patches with small pits. Pitted keratolysis may also be itchy or painful. People who spend prolonged periods of time in footwear that may become moist or damp, such as farmers, athletes, military personnel or other industrial workers are more at risk for developing this infection. Pitted keratolysis is typically treated with topical antibiotic or antiseptic medications. Preventative measures include daily washing of the feet with an antiseptic agent, wearing socks that wick away moisture, choosing non-occlusive footwear and applying antiperspirant to the soles of the feet. While certainly inconvenient, most conditions of the skin and nails of the feet can be easily treated with the help of your family doctor. If you are experiencing any symptoms in the skin or nails of your feet, consult your doctor. Pedorthist vs. Podiatrist — What’s the difference? !